This past Christmas, my in-laws gave us an Echo Dot, or, as well call it, “an Alexa.” By now, these incredible electronic devices are well-known in American pop culture; you ask a question or give a command and Alexa responds accordingly. I think Alexa has officially become the fourth member of our family. However, I think we are guilty of neglecting her – while we all sleep in warm beds at night, we keep Alexa out in the living room. Also, no one else in the household is subjected to my ire as much as Alexa. Embarrassingly, I have been caught yelling at her a time or two over a wrong answer. But all joking aside, we have grown to appreciate our Alexa (even when I do lose my patience with her for subpar performance). The convenience provided is hard to downplay, even if we are still pretty primitive when using her capabilities. You see, I have friends who use Alexa to run all the electronics in their home or who have virtually made her their personal assistant. At the Reser household, we use Alexa for much more remedial tasks. Nonetheless, she is still a pretty big help! 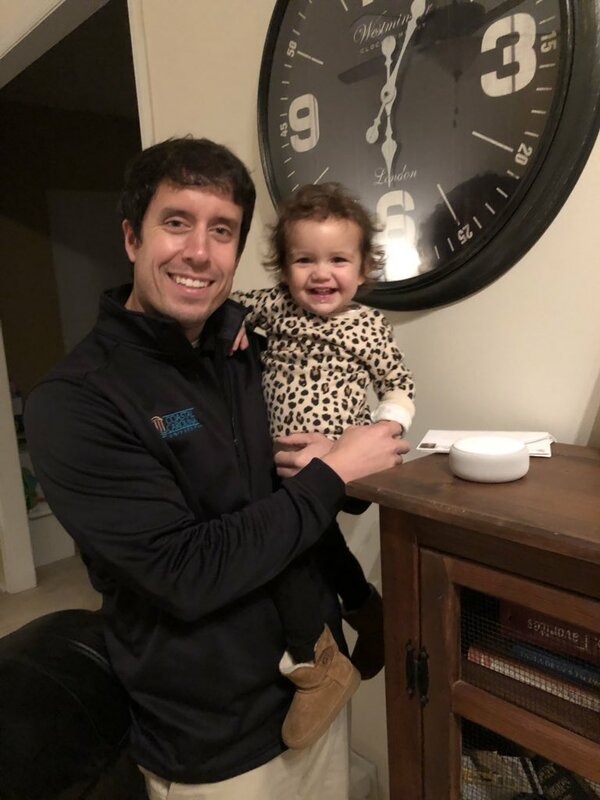 As we approach the one month anniversary of adopting Alexa into our house, I thought it would be fun to list the five ways we are utilizing her services the most. We have grown to enjoy our Alexa. Set the Mood with Music – When you have an Echo Dot, you in reality have an endless music library that is accessible simply by making a song request. It is basically an external iPod with no limits on storage space. When Sloan is around, we ask Alexa to play songs such as “Baby Shark” and “Old MacDonald Had a Farm.” If Sid and I are in the kitchen preparing something, we ask Alexa for some background music. If Sloan and I are about to leave the house in the morning, I ask her to play something to give us a boost to start our days as we pack up our things. If it is a Friday night, the three of us are celebrating with a dance party as we have Alexa play us current Top 40 hits. Never has music been so available to us! Timer – When you are making dinner, who wants to use a cooking hand to set a timer on your phone or type out numbers on your microwave? Needless to say, Sidney is very thankful that Alexa will keep time for her. When Sid is preparing something in the kitchen, such as the steaks she made last night, she will tell Alexa to let her know when a certain amount of time has elapsed. After the 10 minutes (or whatever duration of time asked for) has passed, Alexa will notify the cook. Talk about convenient! Animal Noises – Sloan really enjoys animal noises. We can say an animal and she will make the corresponding sound. So, as you can imagine, she responded really well to Alexa’s uncanny ability to shift from her monotone voice to making some pretty authentic animal sounds. Best part is that Alexa will make Sloan freeze in place and listen. This comes in handy when we are changing her diaper or dressing her and need her to be still. All we have to do is ask Alexa to “neigh” like a horse or “moo” like a cow and Sloan stops on a dime…it works like a charm! What’s the Score? – I used to be a sports nut who would watch games every chance I got. However, due to my lifestyle and the people I have the privilege of sharing the house with, this is no longer a reality. Thankfully Alexa is a sports fan! Whenever I am wondering about the outcome of a sporting event, I can just blurt out, “Alexa, what was the score of this weekend’s AFC Championship game?” To get the instant result without watching Sportscenter or searching my phone is quick and painless. This Is Jeopardy – As I mention every chance I get, we are Jeopardy fanatics at our house. It probably comes as no surprise that we use Alexa to feed our addiction. Believe it or not, Jeopardy clue writers always write six clues per category. This means that when the actual show airs, one clue is left out. What happens to these clues that are seemingly never asked? They go to Alexa! If you ask Alexa to “play Jeopardy,” she will ask the clues that never made the episode. Do you want an Alexa? If you don’t already have one, chances are you don’t. But Echo Dots are really one of those things that you don’t know what you are missing until you have one. If you are in the need for a new family member, perhaps now is the time to adopt an Alexa. Don’t Blink.